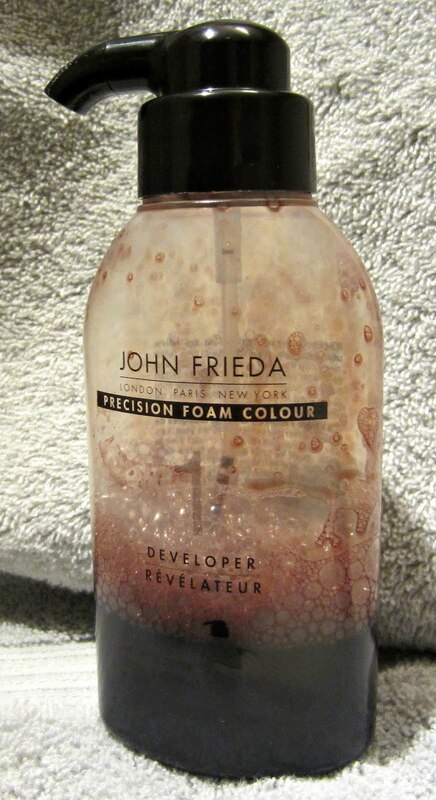 I recently received a coupon in the mail from Rite Aid for John Frieda's new Precision Foam Color. My hair is naturally quite dark, but I have it professionally colored and highlighted most of the year, going several shades darker and reducing the highlights during the winter months. Every now and again I color my own hair, and being short on time these days, I'd thought I'd take advantage of this coupon. This product retails for about $12.99 a box, and the coupon was for a completely free box. 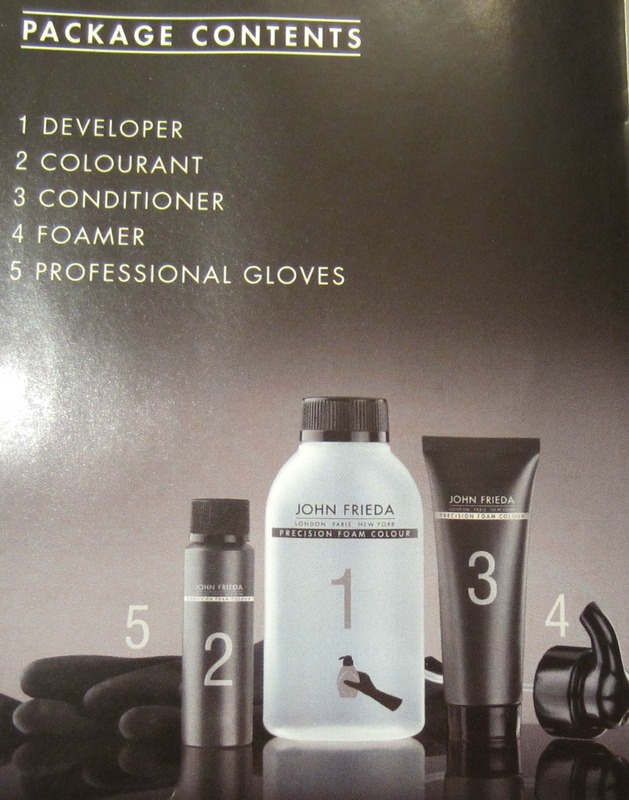 Here's a look at a portion of the product pamphlet, showing the contents. There's nothing out of the ordinary when compared to most at-home dye products, other than the bottle applicator type. The tip or nozzle is a "foamer", allowing the product to be dispensed as a light foam, rather than a typical liquid. The foam is dispensed by gently squeezing the bottle. I did wear the gloves when I applied the product...I just waited until after I was done with the process to photograph so I didn't get hair color on my camera! 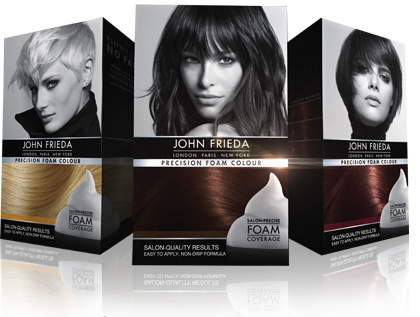 The foam is first applied to your hand, not directly on your scalp like most hair color products. After applying the foam to your hair, you gently massage it in. I basically used the same motions I use when washing my hair. You then allow it to process for 30 minutes. I couldn't seem to capture it well in my photos, but the foam is filled with tiny shimmer or glitter, which I thought was interesting. I selected the Medium Chocolate Brown color, and here's how it turned out. It's much more vibrant than the color on the box shows, it's darker and richer, and it's more mahogany/copper than chocolate brown. The lovely Gia from Nouveau Cheap mentioned to me that she had heard this hair color runs dark, so I chose a couple of shades lighter so I wouldn't end up with Elvis hair! They offer a shade called Deep Cherry Brown, which I was immediately drawn to, but I was afraid that it might turn out much darker than it appeared on the box. As it turns out, the shade I ended up with in actuality, looks much closer to that shade than it does to the shade I chose. The shade below shows the shade I used according to the product's web site. This is how it looked on the box as well, so I would recommend as Gia did to me, to keep in mind that this shade doesn't run true to the color shown on the box. 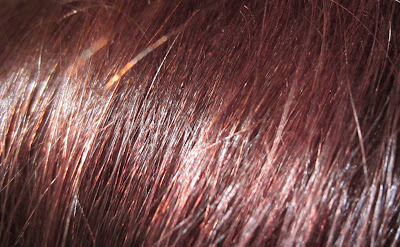 I'm happy with this shade on my hair, and it's extremely shiny and soft. 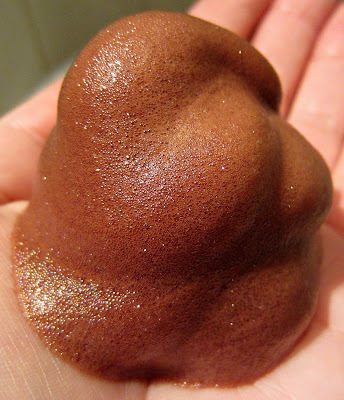 The application was easy, and because the product is a foam, I didn't experience it dripping or running onto my face or neck like I do when I use a traditional hair color. The scent wasn't strong or unpleasant, and the color that was on the skin at the edge of my hair line came right off. Would I purchase this product again? Personally, while I'm very happy with the application process and the end result, I probably would not, simply because of the price. When I color my hair at home, I typically use Revlon Color Silk, which retails for $2.99 a box. I have some pesky grey hairs at my temples, and no matter what type of color is on my hair--professional or drugstore--those grey hairs pop out within 10 days of a color treatment. Now, if this product manages to keep them covered for 3 weeks, I might be more inclined to spend the extra money on it. I prefer having highlights to just a single color process, so I don't color my hair myself all that often. If I did color my own hair on a regular basis, I still think I'd stick with the Revlon. The application is easier and neater with the John Frieda product, but otherwise, it didn't do anything more for me than the Color Silk. To be fair, I'll give it a couple of weeks and then update this post on my thoughts again. Initially, I say that the results are not that different from the Revlon product, but I'll re-evaluate the shine factor and color for fading (copper hues tend to fade fast on me no matter what the brand), and the gray coverage at the end of this month. Update: As promised, I'm updating my thoughts on this product after 3 weeks. I stand corrected in saying that I would likely stick to Revlon Color Silk when performing a single color process on my hair. The John Frieda did indeed keep the pesky greys covered for more than 3 weeks. The color has faded, but less than it does with the Revlon, by far. The shine factor is still holding strong, and my hair has never been this shiny. I'm not sure if it's the color, the conditioner that comes with it, or both. The shade turned out really pretty. I quit coloring my hair years ago. My grey would pop out within 2 weeks around my hairline. I was getting my hair professionally colored. It was getting to expensive. I tried doing it at home with worse results. Professional products do work better. I just couldn't take it after awhile. I cut my hair short & let the grey grow in.